AFC Wimbledon moved into the play-off places with victory at Notts County. The visitors survived an early scare when Blair Adams headed against the post before taking the lead with a stunning long-range strike from Tom Elliott that found the top corner. Andy Barcham then crashed a shot against the bar before he stroked the ball in to double Wimbledon's advantage at Meadow Lane. 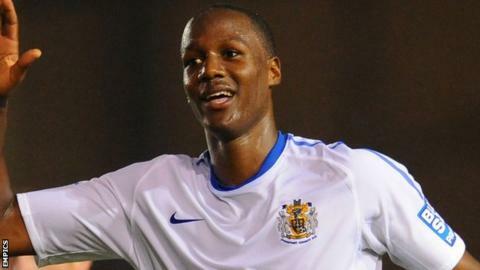 Izale McLeod spurned the best of County's chances, as the Dons held on. "I thought we were outstanding from start to finish. "We had 19 attempts on goal away from home. "We cut them open time and time again, dominated the game from start to finish and it's as complete an away performance as you'll ever get. "I can't give the boys enough credit - they were superb." Match ends, Notts County 0, AFC Wimbledon 2. Second Half ends, Notts County 0, AFC Wimbledon 2. Attempt missed. Jonathan Meades (AFC Wimbledon) right footed shot from outside the box misses to the left. Wesley Atkinson (Notts County) wins a free kick in the attacking half. Attempt saved. Adebayo Azeez (AFC Wimbledon) right footed shot from the right side of the box is saved in the bottom right corner. Adam Campbell (Notts County) wins a free kick in the attacking half. Andy Barcham (AFC Wimbledon) hits the bar with a right footed shot from the centre of the box. Attempt missed. Curtis Thompson (Notts County) right footed shot from outside the box is close, but misses to the right. Goal! Notts County 0, AFC Wimbledon 2. Andy Barcham (AFC Wimbledon) right footed shot from the centre of the box to the bottom left corner. Assisted by David Fitzpatrick. Haydn Hollis (Notts County) wins a free kick in the attacking half. Corner, AFC Wimbledon. Conceded by Robert Milsom. Substitution, AFC Wimbledon. David Fitzpatrick replaces Sean Rigg. Attempt saved. Ronan Murray (Notts County) right footed shot from outside the box is saved in the centre of the goal. Substitution, Notts County. Ronan Murray replaces Izale McLeod. Andy Barcham (AFC Wimbledon) hits the bar with a right footed shot from the left side of the box. Substitution, Notts County. Liam Noble replaces Scot Bennett. Corner, Notts County. Conceded by Jake Reeves. Lyle Taylor (AFC Wimbledon) wins a free kick in the defensive half. Attempt missed. Izale McLeod (Notts County) right footed shot from the centre of the box is close, but misses to the left. Attempt saved. Tom Elliott (AFC Wimbledon) header from the centre of the box is saved in the centre of the goal. Attempt missed. Scot Bennett (Notts County) header from the centre of the box is just a bit too high. Wesley Atkinson (Notts County) wins a free kick in the defensive half. Foul by Callum Kennedy (AFC Wimbledon). Sean Rigg (AFC Wimbledon) is shown the yellow card for a bad foul. Scot Bennett (Notts County) wins a free kick in the attacking half. Foul by Sean Rigg (AFC Wimbledon). Attempt missed. Blair Adams (Notts County) right footed shot from outside the box is high and wide to the left. Attempt missed. Lyle Taylor (AFC Wimbledon) left footed shot from the centre of the box is close, but misses to the left. Attempt missed. Wesley Atkinson (Notts County) right footed shot from outside the box is too high.